Overview: The Mongolians are an Altaic people. 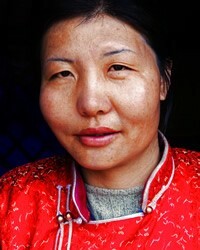 Most live in Mongolia or in northern China along a 3,000 kilometer arc of territory south of Mongolia. Nine other, smaller groups of Mongol peoples live scattered across China--remnants of the Mongol armies that conquered the land in the 13th Century. Mongol emperors ruled China from 1294 to 1420. Some Mongols live in Russia around Lake Baikal and in the Caspian area of Russian Europe.